Spending the week here so blog posts may be sparse. If you look at the last post I promised a picture of the couch I want to recover... well imagine this love seat with shorter legs and longer and you have the general picture. It has a lot of potential. 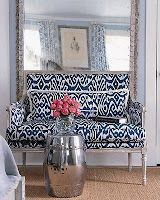 I love the fabric on this couch, it combines the classic look of the frame with a more modern pattern that gives it pazazz! This is where I will be next week (not swimming, the Great Salt Lake smells so bad) but posts may be a little more regular then.